Unless you were a part of someone's history or at the very least, know most of it, never come out in the open to say anything about them. Spewing derogatory comments about a genuine historical struggle only exposes your barbaric convictions and smothering your discernible mischief with beautiful words only goes to show how much of a sadist you might turn out to be. Today alone, I have read the most despicable things from so-called intellectuals berating a cause championed by hundreds of thousands of people and thankfully, those posts have received concomitant backlash from various corners. In fact, it gladdens my heart to see hate propagandists reduced to powder by the same people who once esteemed them. Trust me, it's a fantastic feeling. I trust there will be more of such cases, unless of course deterrents are bred. Personally, I hold strong reservations for the kind of impression Nnamdi Kanu has given since he was released from jail but we all might agree to one thing - without his vituperations which started few years ago, the Biafran struggle may never have been rekindled in the hearts of many. While some believe Kanu is an opportunist seeking global recognition and cheap publicity, I choose to see him as a man whose colossal passion is deeply rooted in anger following the inhumane treatment suffered by his people at the hands of a bloodthirsty government. You see, Nnamdi Kanu might be everything you don't wish for in a national leader but only a few humans alive possess his kind of mettle. Yes, you can take that to the bank. I choose to see him as a man playing to the gallery curated by seasoned artist who are at the top of the MASSOB/IPOB struggle. You wouldn't expect a man like Kanu to be solely in charge of his public engagement. I mean, this is a man whom many see as a figure of hope and find enough reason to revere, much to the distaste of others who feel he's being worshipped. But we need to realize that for every cause, there's the extremist version. 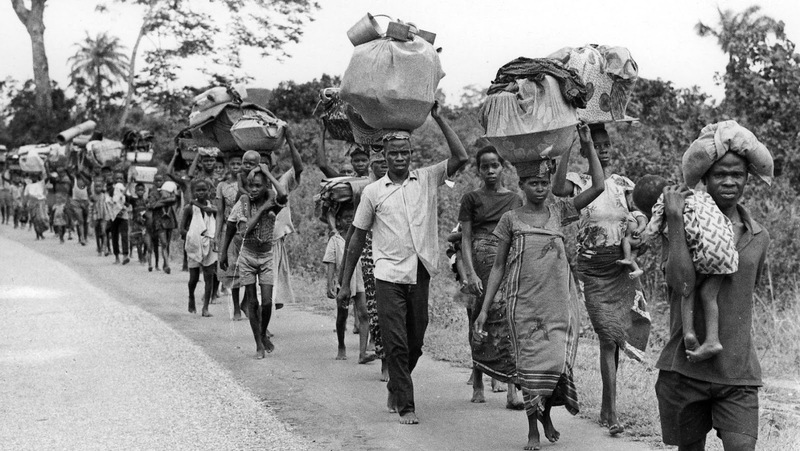 The true Biafran cause was borne out of a grim history of genocide, hunger and consequently, the urgent need for national reforms to assuage painful memories. On the other hand, Nnami Kanu's cause remains largely amorphous and this is where it gets worrisome. That people are bowing before him is not my problem, neither is his choice of Jewish affiliation. I am particularly concerned about how speed has overtaken direction in his struggle. Kanu seems to be going nowhere fast. Let me also remind you that the Biafran Memorial has got absolutely nothing to do with Nnamdi Kanu, rather, it's a noteworthy commemoration of the travails of a people whom despite being victims of some of the worst atrocities known to mankind, have managed to remain resolute and forward-driven. People are remembering their dead, not Nnamdi Kanu. People are exalting their true heroes past, not Nnamdi Kanu. People are convinced of a better tomorrow, either as Nigerians or otherwise, not Nnamdi Kanu. That is the beauty of it all. If you haven't read anything about Biafra, you need to. Quickly! Only then will you be able to understand the workings of a Biafran mind. In my opinion, every Igbo man is automatically a dual citizen. I might be wrong but from the handful of books and journals I've read, Biafra is an undying flame. Even if adequate compensation is paid to the family of victims, the memories will never fade away. It's why major parts of the South East are in total compliance with today's remembrance. Speak all you want. They have a history and you, you know nothing. Honestly, I will encourage you to read books about Biafra. Learn from history. And please, somebody please enjoin Nnamdi Kanu to clearly itemize his plans and save thousands the stress/heartbreak. He has the clout, the following and is arguably one of Africa's most influential icons. But please, what is he doing?